The changelog is a record of all modifications on a given replica that the supplier uses to replay these modifications to replicas on consumer servers (or suppliers in the case of multi-master replication). If a supplier server goes offline, it is important to be able to delete the changelog because it no longer holds a true record of all modifications and, as a result, should not be used as a basis for replication. A changelog can be effectively deleted by deleting the log file. Directory Server automatically removes the content in the changelog directory after you removed the cn=changelog5,cn=config entry. 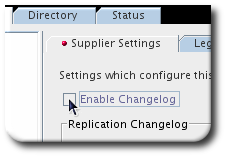 Select the Replication folder in the left navigation tree and then the Supplier Server Settings tab in the right pane. Clear the Enable Changelog check box. Restart Directory Server. See Section 1.4.2, “Starting and Stopping a Directory Server Instance Using the Console”. Reinitialize the consumers. See Section 15.17, “Initializing Consumers”.